A New Bag For Halston! Halston over at The Importance of Being (a very entertaining blog) is a very amazing photographer and we did a trade. 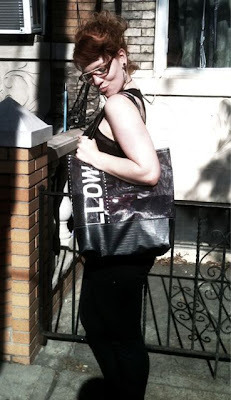 She took some great photos for me and I got to pay her with a recycled billboard bag. She seems very happy with it! Head over for her blog for some terrific wordsmithing and cool photos! PHOTO OF THE DAY ON MARKETS OF NEW YORK! Brooklyn Craft Take Over at Homebody Boutique!